I have been waiting oh, so patiently for a warm Spring day so I could work outside. I have been ready since the middle of March. Over the winter months I had both of my hands repaired, the left one in October and the right one in January...carpal tunnel release surgery that was very successful! With my hands back to normal and cortisone shots in each knee two weeks ago, I have been eager to be digging in the dirt in my gardens. The day came last Monday (April 8). Seeing temperatures headed for the 80's and hearing Kay's admonition to be careful with my knees, I headed into the sunshine with my rolly cart and my digging tools. I had not been digging long before I realized that the time was perfect for digging dandelion for a favorite Weaver/Neff family dish. No flowers and few buds, just newly growing deeply jagged leaves, spreading themselves very flat on the grass. So I headed around the house with a bucket and and old knife to cut them out below the grass line. In a half and hour, my bucket was half full, and by the time I trimmed and cleaned each plant I had a little over a pound of greens. I come by this foraging quite honestly. 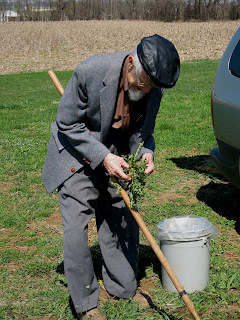 My Grandfather S. Clyde Weaver gathered buckets of dandelion greens each Spring. Then he would spend hours cleaning each plant. Grandmother Emma would tightly pack the greens in quart jars and preserve them. 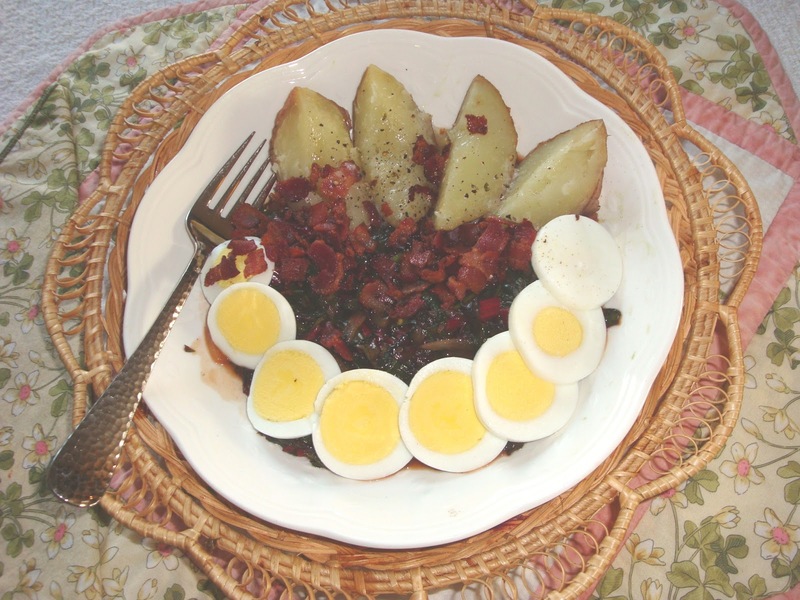 During the holidays, there would be steaming bowls of dandelion greens with sweet and sour bacon dressing, topped with sliced hard boiled eggs and crumbled bacon. My father, Paul Neff, continued the tradition, probably not at the level of Granddad, but close. He had a way cleaning them in the field that I had forgotten until halfway through my own job of cleaning those little plants. He also had a way of finding really large plants. The ones I was digging Monday seemed quite small in comparison to my memory of his. I think he watched and noted where the gathering was good. Cultivated dandelion greens can be purchased in the produce department of some grocery stores and sometimes at farmer's markets. They look different, and are milder than the wild greens. Both are slightly bitter. Either variety is said to be quite healthy....well that is until you add the bacon dressing, which in my opinion makes the dish. Having gathered the greens, either from the field, or your favorite produce department or farmer's market, here is the recipe that makes the dish. I fined tuned what I knew about my mothers and my grandmother's bacon dressing. My recipe is for 1 serving, because I like my greens fresh, without leftovers. And this is probably an acquired taste. I grew up with this special dish for a very limited time in the spring and sometimes at holidays. Add water and 2 tablespoons of the vinegar. Cook until the mixture begins to thicken. Taste and adjust the vinegar if desired. Add the greens stir up the dressing to coat. Cover and steam until the greens wilt. I developed this recipe over the winter and used greens available at the farmer's market and grocery produce department. rainbow chard, baby spinach, kale, beet greens or mustard greens. Most often I mix the greens, chopped and weighed. 4 ounces of winter greens. Some of them wilt to almost nothing. Lots of us eat greens as part of our healthy diets. Hot sweet and sour bacon dressing may push the health edge just a little. But the next time you want to try something new with your evening meal, try dandelion. It is available at this thine of the year, just outside your back door!